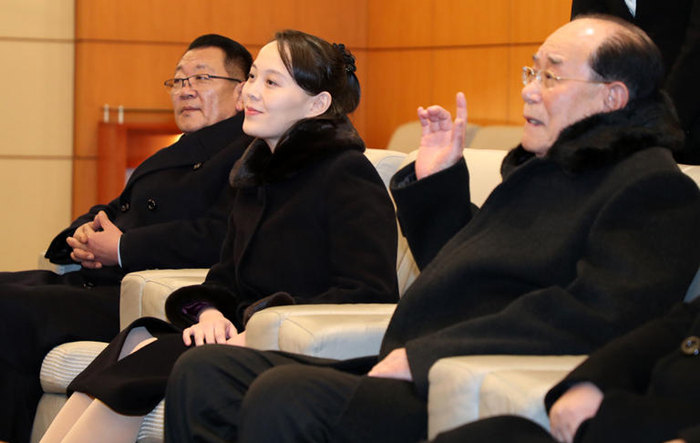 North Korea's high-level officials including its leader Kim Jong-un's younger sister Yo-jong arrived in South Korea aboard a chartered plane on Friday. They arrived at Incheon International Airport at around 1:40 p.m. Some aspects of the visit violate international sanctions and could weaken international efforts to pressure the regime into giving up its nuclear weapons program. Kim Yo-jong is on a U.S. Treasury blacklist and subject to having her overseas assets frozen but not on a UN Security Council blacklist that prevents North Korean officials involved in the nuclear development from traveling. 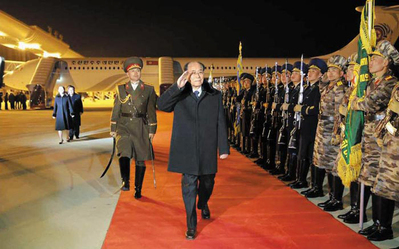 The delegation is headed by North Korea's titular head of state Kim Yong-nam, a nonagenarian who is a mere figurehead and not on any blacklist. Cheong Wa Dae spokesman Kim Eui-kyeom told reporters that President Moon Jae-in will meet the North Korean delegation and have lunch with them. Government officials hope they will bring a letter from Kim Jong-un. Under the UNSC sanctions, all North Korean passengers and cargo must be thoroughly searched, but this is highly unlikely to happen. Kim Jong-un owns two antiquated Soviet-era passenger planes, Antonov AN-148 and an Ilyushin IL-62. A Unification Ministry official said, "I believe they are not subject to any sanctions." But South Korea and the U.S. announced sanctions against North Korea's Air Koryo in December 2016, while the U.S. sanctions include Kim's passenger planes. At that time, the U.S. Treasury Department said Air Koryo owns and operates all passenger planes in North Korea. The ferry Mangyongbong-92 took North Korea's Samjiyon Orchestra to Gangwon Province earlier this week, despite a South Korean ban against all air and shipping traffic from the North. The North Korean plane will return to Pyongyang and fly back to Incheon International Airport on Sunday to pick up the high-ranking officials. Seoul could end up undermining sanctions if it provides the fuel. A bigger problem was sports official Choe Hwi, who is also on the delegation and is under a UN travel ban. But the UNSC granted him an exception for this visit at the request of the government here. When Choe and 13 other North Korean officials were blacklisted in June of last year, the Foreign Ministry here said it "unanimously supports" the measure and added that the measure "once again confirms the firm will of the international community to pursue denuclearization." North Korea has not taken any steps to abandon its nuclear weapons since, and it is unclear what Choe's presence has to contribute to anything.